In order to collect rings first you have to make them! Do this by making a match next to any of the four switches along the top row. You can make two rings at once if you make a match in-between the switches. This level uses boomerangs which allow you to grab a gem from the column above it and pull it into the reel. Once in the reel you can use it just like any other gem. Think about using shifters to move boomerangs to where you need them! While this level starts with five spins you will need several more to collect all 10 rings, so be careful to get as many free spins as you can! How do I collect those pesky rings once I've made them? Use a boomerang to move a ring into the reel and then match it on the board. Create a super wild gem by using a wild that matches three different colors, and then match it to remove all gems of the matched color from the board - including rings! 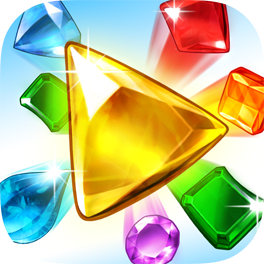 Match eight or more gems in a horizontal row to make a vertical burst gem. Take care to make the match in a column above a ring so you can later trigger the burst gem to capture a ring.